MasterBind Soft Linen Covers provides the traditional presentation with the soft, classic feel. The 8.5 x 11" features an elegant display that ensures a great depth of quality and are sure to set your project or report apart from the rest. The MasterBind Soft Linen Covers are designed and constructed for easy personalization like offset printing, silk screening, foil stamping, embossing, scored, folded, or even glued. Additionally, there are three color selection including black, navy and maroon. Enhance your reports with this simple but premium soft linen covers today. Transcript: Welcome to MyBinding Video. These are the Linen Soft Covers from MasterBind. These covers offer a flexible, soft, classic appearance. They have a gentle feel and a very soft reflection in the light. They’re great for personalization like offset printing, silk screening, foil stamping, embossing, scoring, folding and even gluing. Use these covers to enhance your booklets and reports. They’re available in navy blue, maroon and black, all in packs of 100. For more videos and all your binding needs, visit MyBinding.com. Welcome to MyBinding Video. These are the Linen Soft Covers from MasterBind. These covers offer a flexible, soft, classic appearance. They have a gentle feel and a very soft reflection in the light. They’re great for personalization like offset printing, silk screening, foil stamping, embossing, scoring, folding and even gluing. Use these covers to enhance your booklets and reports. They’re available in navy blue, maroon and black, all in packs of 100. For more videos and all your binding needs, visit MyBinding.com. Is this paper thick like card stock? Thank you for your question. 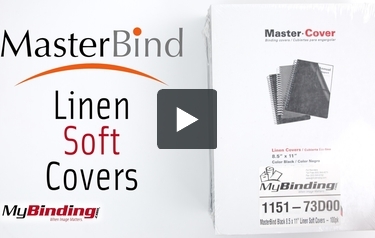 We reached out to Masterbind and their Linen Soft Covers are a 16 point ( approx 85#) cover stock.